Cataracts are common, age-related clouding of the clear lens that covers the eye. 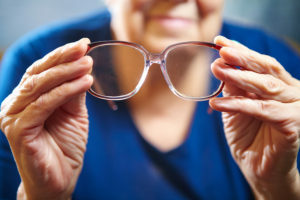 Though they are not dangerous or threatening to the eye health, cataracts can be an inconvenience when performing seemingly routine tasks, such as reading, driving, cooking, or watching TV. Cataracts often start small and evolve into larger vision obstructions. Some of the most common symptoms of cataracts include clouded and blurred vision, as well as impaired night vision, light sensitivity, or seeing halos around lights. Treatment for cataracts usually begins conservatively using eyeglasses or simply turning on brighter lights. But as cataracts progress, they may require vision restoration surgery. Cataract surgery is the most common surgery in the world. Everybody gets cataracts, and will eventually need the surgery. According to a recent study, the average age of cataract surgery in the U.S. is 72 years old. In order to slow down the progression of cataracts, the National Eye Institute recommends protecting your eyes with brimmed hats and a nutritious diet full of leafy green vegetables and antioxidant-rich foods. Although you should be seeing your optometrist regularly for eye exams, it is important to make an appointment at the first sign of vision changes. If you have not had any vision changes, but are age 60 or older, you should be getting a comprehensive dilated eye exam and minimum of one time every year. Cataract surgery is a very safe procedure performed everyday across the U.S. If you require surgery on both eyes, note that only one eye will be operated on at a time. During the surgery, your eye will be numbed and you may be placed under sedation to help you relax during the procedure. Using a special instrument, your cataract surgeon will carefully remove the clouded lens from your eye and replace it with an implant made of silicone, plastic, or acrylic. Cataract removal is an outpatient procedure, usually about 5-7 minutes on the operating table, no stitch or patch afterwards. You should be able to return home the same day as your surgery. Cataract surgery is successful in about 98 percent of all cases. Following the post-operative instructions of your eye doctor can help improve your chances of a positive outcome. You will experience some mild itching following your surgery, as well as some sensitivity to light. Be sure to use the eye drops prescribed to you in the days following your procedure and avoid lifting heavy objects or putting pressure on the eyes during the healing period. Follow-up to all your post-operative appointments.